My husband and I welcomed our little girl Auden Emory into the world almost four months ago. 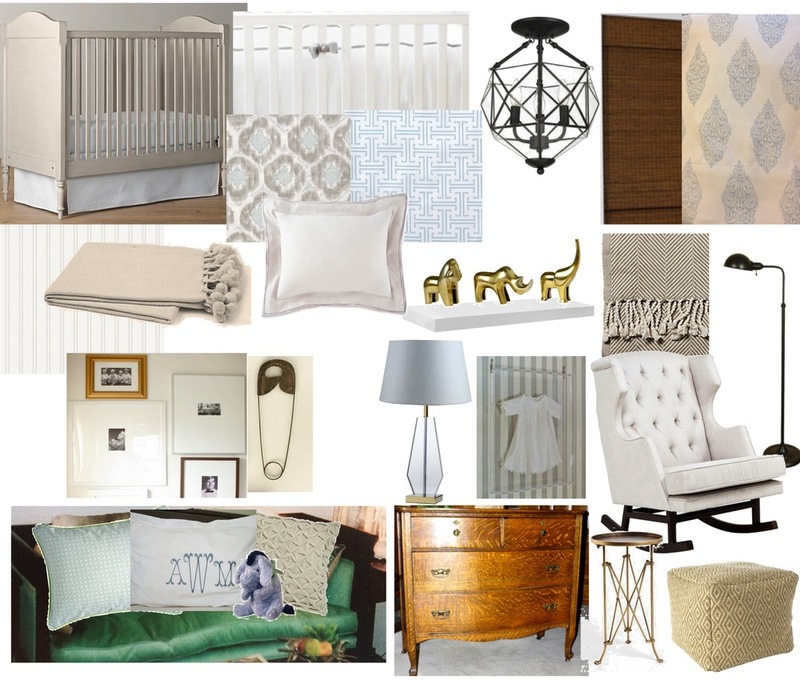 Her nursery was probably the most personal space I've ever designed. I wanted it to be sweet, calming and full of meaningful family pieces. Our photographer snapped a few images of it when she came to shoot Auden's newborn shoot, and I had to share them, along with a few of my own showing you all of the details to our baby girl's room. Below was my original mood board. I really like how it all turned out with the exception of the wall color. It came out much more yellow than the taupe I wanted. I had purchased a few samples and put them on the wall to make my selection. After I picked my favorite, I decided to take it to the hardware store down the road to have them match it instead of going across town where this particular brand was actually sold. I will never do that again--a least for not for a neutral color. Unfortunately the match did not turn out like the sample, and I didn't have the heart to ask my husband paint it again. Lesson learned, friends. All that aside, it was great to see my vision come to life. This dresser is a family piece and has a bunch of "memories" styled on the top of it. The baby booties belonged to my mom and the round frame holds a picture of my sister and I when we were little. The brass animal figures were Target finds. The Bible and silver cup were mine as a child and the sterling rattle was my sister's. The framed image is photo of my grandmother as a child. I framed a Feltman Brothers dress that I wore as a little girl above her crib. The eyelet pillow in her crib was found at JCPenney and the sheet from Serena & Lily. Here's a shot of my hubby and pup Remington hanging out with Auden. The gallery wall above them is a mix of DIY artwork, commissioned watercolors and maternity photos. The sofa is a family antique once belonging to my great grandmother. A collection of neutral pillows and gifted elephant and tiger stuffed animals (representing the mascots for mine and my husband's alma maters) fill out the sofa. The watercolor dog prints of our fur babies are some of my favorite pieces in the room. Erisha from A Thing Created did a wonderful job. The "I will be grateful for this day" print is an Etsy purchase that I've had for a couple of years and thought would be perfect moved into the nursery. The oversized clothespin is one of a set of three from Ballard Designs, also a piece I've had for years waiting to use. The curtains were a great surprise TJ Maxx find ($25 for the pair!). I added pleats with pleat tape to give a more custom look. I imagine we will spend many nights rocking and reading in this chair. I hope Auden loves her room as much as I do one day. Thanks for taking the tour! I've posted a resource list below for your convenience. White Pique Crib bumper and skirt-New Arrivals Inc.